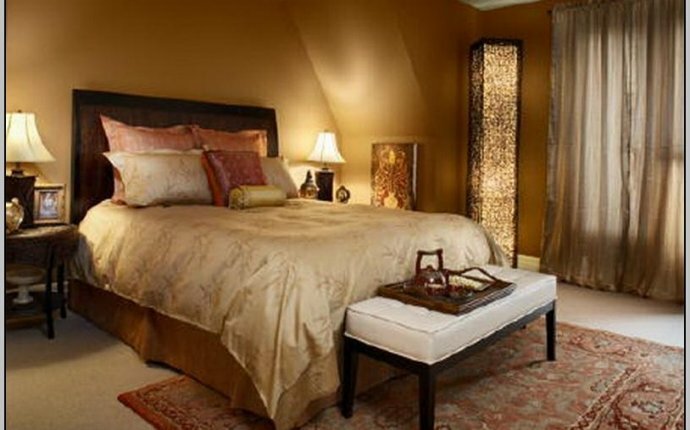 According to Feng Shui principles, a master bedroom should be a private place reserved for rest and romance only. Does your bedroom support both? A few simple Feng Shui changes, especially in regard to color, artwork, and bed placement, can help make this most important room more appealing. Choosing a color for your bedroom walls is the first step in creating a bedroom sanctuary where you can relax and nurture your romantic relationship. When choosing bedroom colors, the Feng Shui rule of thumb is that warm colors create warmth in your relationship, while cool colors can cool it down. The next consideration in making Feng Shui adjustments in your bedroom is to decide what art you want to hang on the walls and display on your furniture. When selecting bedroom art, keep in mind that what you see from your bed influences how you start and end your day, so make it a pleasant view that both partners enjoy. Feng Shui principles suggest displaying restful and romantic artwork that shows pairs of people or objects, and photographs of you and your spouse or partner. Here are some Feng Shui "cures, " or adjustments, for common problems in the typical adult bedroom. Problem: Your bed is in a direct line with the door to the room. Cure: When your bed is directly across from the door you feel vulnerable because you are easily seen by anyone entering the room. If you can’t move your bed, add a substantial footboard or place a trunk or bench at the foot of the bed for protection. Problem: A mirror is hung directly across from the bed. Cure: A mirror in a bedroom can make you restless, especially if you can see yourself in it when you are in bed. Replace all mirrors with fine art, posters, or beautiful wall hangings and fiber art. If you must keep your mirror, cover it before going to sleep. Problem: Your bed is positioned in a corner, against two walls. Cure: When a bed for two people is positioned against two walls, one of the partners can feel symbolically “trapped” in the relationship because he or she can’t get out easily. Good Feng Shui principles recommend that you always position a bed for an adult with the head against a wall and ample room to walk around it, even if this means switching to a smaller size bed. Problem: You can see the toilet from the bed. Cure: Toilets are associated with waste in Feng Shui, and looking at one from your bed can disrupt restful sleep. Keep the bathroom door closed when you sleep, or position plants to create a foyer in front of the bathroom and screen it off from view.